An 11-year-old male neutered Cocker Spaniel presented for evaluation of bleeding cutaneous nodule between digits 2 and 3 on the right forelimb. The lesion was 1 cm, erosive and bleeding, and slightly stalk like. What is Your Interpretation of the Cytology? Fine needle aspirate cytology slides were collected from the digit mass and submitted to IDEXX for review by a clinical pathologist. 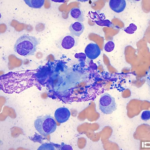 What is your interpretation of the following cytology images? Figure 1. Interdigital mass. 500x magnification, Wright-Giemsa stain. Figure 2. Interdigital mass. 500x magnification, Wright-Giemsa stain. Figure 3. Interdigital mass. 1000x magnification, Wright-Giemsa stain. The slides are highly cellular, and the majority of the cells are discrete large round cells. These have eccentric round, oval, to slightly indented nuclei with stippled chromatin, occasional nucleoli, and a moderate amount of deeply basophilic cytoplasm. The cells have moderate anisocytosis and anisokaryosis, and there are occasional binucleated and multinucleated cells. Rare cells have an eosinophilic border. Occasional mitotic figures are seen. There are a few scattered anucleate squamous cells that have many associated extracellular bacteria. Most of these are bacterial cocci, but there are also fewer rod-shaped bacteria. 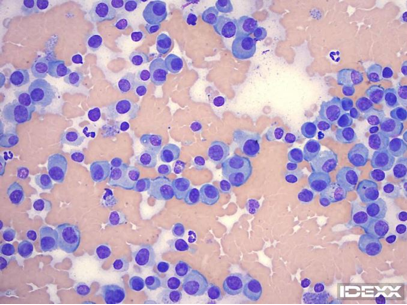 There are low numbers of nondegenerate neutrophils, but these may be present from peripheral blood rather than inflammation, as abundant blood is also noted in the background of the slides. As these bacteria are associated with squamous cells and are not seen intracellularly, these may be present from superficial bacterial overgrowth. The lesion was excised and was submitted for histopathology, which confirmed the cytologic interpretationof cutaneous plasmacytoma. Histopathological features supportive of plasmacytoma included: roughly ovoid, slightly exophytic, discrete but unencapsulated tumor outline; dense sheeting cellular configuration; consistently round cytomorphology with discrete cellular borders and eccentric nuclei; clock face-type nuclear pattern; distinct perinuclear clear zones (Golgi apparatus); fairly frequent bi- and tri-nucleated forms. There was also an absence of peripheral lymphocytic inflammatory infiltrates, epitheliotropism, intraepithelial nest formation, cytoplasmic pigmentation and cytoplasmic basophilic granulation, features which would potentially indicate histiocytoma, epitheliotropic lymphoma, epithelioid melanoma or mast cell tumor, four of the main histological differential diagnoses. Cutaneous plasmacytomas (plasma cell tumor) are typically single, small, raised, alopecic dermal masses that may be ulcerated, and their gross appearance is similar to a histiocytoma or mast cell tumor. Most cutaneous plasmacytomas occur in older dogs, and the median age at presentation is 9-10 years. Predisposed breeds include cocker spaniels, terrier breeds, and standard poodles. Common locations include the digits, ear pinna, and oral cavity. Cutaneous plasmacytomas are rarely seen in cats. Cytology is helpful to differentiate between these tumors to help guide treatment decisions. Cutaneous plasmacytomas are typically benign and complete excision is usually curative, although occasional patients may develop recurrence or multiple primary cutaneous tumors. Rarely, multiple skin lesions can be seen in association with multiple myeloma, but these patients typically also have hyperglobulinemia with monoclonal gammopathy and/or hypercalcemia. 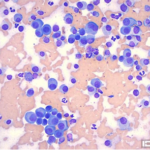 Many plasma cell tumors can be diagnosed on cytology based on the cell morphology alone, although some can be difficult to differentiate from histiocytomas (even on biopsy), which are also benign. Binucleated and multinucleated cells are much more commonly seen in plasma cell tumors than histiocytoma, which can help differentiate these. The cytoplasm of plasma cells is also typically more deeply basophilic. Extracellular eosinophilic material (amyloid) can also be present in some plasma cell tumors. For poorly differentiated or anaplastic tumors, histopathology of excisional samples and immunohistochemistry may be required to confirm the cell lineage. Fisher, DJ. Cutaneous and Subcutaneous Lesions. In: Valenciano AC and Cowell RL, eds: Cowell and Tyler’s diagnostic cytology of the dog and cat, 4thed. St. Louis: Elsevier, 2014; 80-109. Raskin, RE. Skin and Subcutaneous Tissues. In: Raskin RE and Meyer DJ, eds: Canine and feline cytology a color atlas and interpretation guide, 3rded. St. Louis: Elsevier, 2016; 34-90.